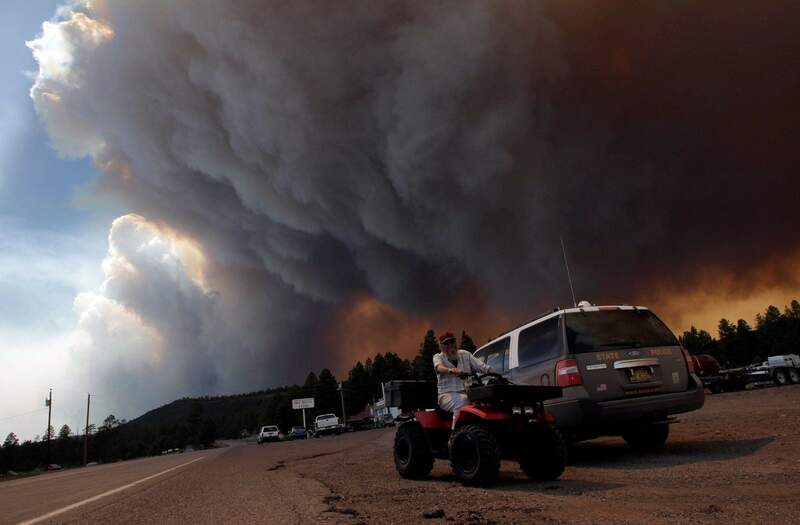 Robert Joseph, 64, rides his all-terrain vehicle as smoke plumes from the Wallow Fire fill the sky Monday in Luna, N.M.. Firefighters worked furiously Monday to save a line of mountain communities in eastern Arizona from a gigantic blaze that has forced thousands of people from their homes. Smoke plumes from the Wallow Fire rise over the Apache-Sitgreaves National Forest near Luna, N.M., Monday, June 6, 2011. Firefighters worked furiously Monday to save a line of mountain communities in eastern Arizona from a gigantic blaze that has forced thousands of people from their homes and cast a smoky haze over states as far away as Iowa. 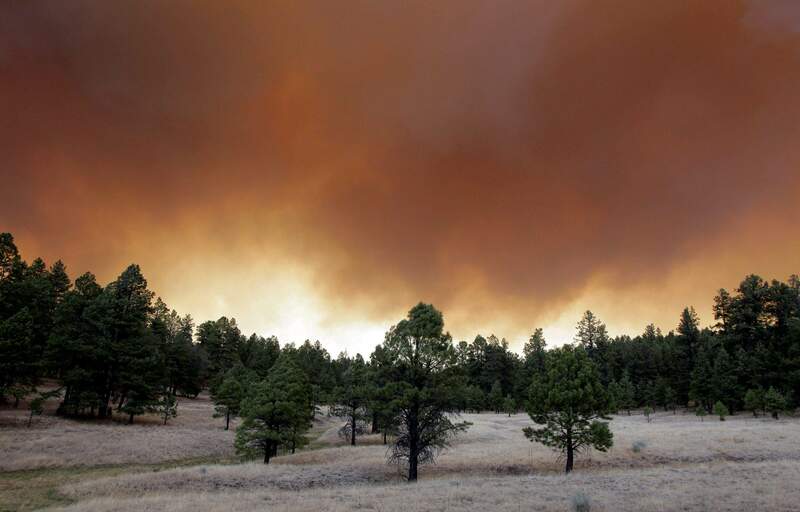 SPRINGERVILLE, Ariz.  Stiff winds whipped up a gigantic blaze in the mountains of eastern Arizona on Monday, forcing the evacuation of a third resort town and casting a smoky haze over states as far away as Iowa. Winds of about 30 mph, with gusts above 60 mph, blew heavy smoke from the fire into Greer, a picturesque town where most of the 200 full-time residents already had fled. Everyone who was still there and in the nearby area known as Sunrise were ordered to leave Monday afternoon. Its heartbreaking, Allan Johnson, owner of the 101-year-old Molly Butler Lodge in Greer, the oldest in the state, said of the fire barreling down on the resort town. He was pessimistic about the chances of saving the lodge and the hundreds of vacation homes in the area. Were numb  our entire family and our friends are just numb, he said. Late Monday, a huge pall of black smoke loomed over the twin towns of Eager and Springerville, home to about 7,000 people, and sheriffs officials told residents there to prepare to leave. Its probably and, Im going to say this, going crazy, fire information officer Kelly Wood said of the fire. The fire was projected to have grown to nearly 365 square miles, officials said Monday, based on overnight mapping flights that have not yet been verified. Officials believe an abandoned campfire may have sparked the blaze more than a week ago. So far, the flames have destroyed five buildings and scorched nearly 230,000 acres of ponderosa pine forest. No serious injuries have been reported. The blaze nearly doubled in size between Saturday and Monday. About 2,500 firefighters, including many from several western states and as far away as New York, are working to contain the wildfires, fire information officer Peter Frenzen said. The federal government has stepped up and done their job, and we believe we have everything that is necessary at this point in time to keep everything under control, Brewer said. We feel at this point in time that all the boots that are necessary are on the ground now, she said. Fredin said the smoke wouldnt be noticeable in the Midwest, where humidity already makes conditions hazy. He said it could, however, produce striking orange-pink sunrises and sunsets. In Arizona, the fire and heavy smoke created pea-soup visibility, forcing the closure of several roads, including about a two-mile stretch of U.S. Highway 180 between Alpine and the New Mexico line, Frenzen said. Heavy smoke is visible at least 200 miles to the northeast, in Gallup, N.M. By Monday evening, smoke was filling the valley surrounding Albuquerque. In Springerville, Ariz., about 15 miles from Greer, a giant plume of white smoke that had billowed thousands of feet into the air turned black as dusk neared. The smell of smoke permeated the community and nerves were rattled. David Chimera, owner of the Spur Feeds Store at the edge of town, said customers have been coming in to buy seed and other supplies for their horses and livestock as they make preparations to evacuate. Some already have left homes that are closer to the fire. Larry Hoppe was one of them. Hoppe, who lives with his family near Nutrioso, was on vacation in Arkansas when he heard about the fire. He said his two horses were too spooked by the smoke, wind and commotion to be loaded and had to remain at his home. The good Lord has given us plenty of time. We didnt have to do anything in a panic mode. We had time to make an orderly evacuation, he said. Its amazing the blessings you get as the storm is going on, Hoppe said. Firefighters have, so far, kept the flames out of Alpine and Nutrioso. Residents of the New Mexico town of Luna, about 15 miles east of Alpine, were warned Monday to be prepared to evacuate if the fire closes in. The fire is the states third-largest, behind a 2002 blaze that blackened more than 732 square miles and destroyed 491 homes and a fire in 2005 that burned about 387 square miles in the Phoenix suburb of Cave Creek. Another major wildfire, the states fifth-largest, burned in southeastern Arizona, threatening two communities. The 156-square-mile blaze devoured two summer cabins and four outbuildings in recent days but werent reported earlier because crews couldnt reach them, fire-management spokeswoman Karen Ripley said. Ripley said that the 100,000-acre fire held steady throughout Sunday. They did quite well in holding the fire today, Ripley said.